The paper "GRB 170817A-GW170817-AT 2017gfo and the observations of NS-NS, NS-WD and WD-WD mergers" by J. A. Rueda, R. Ruffini, Y. Wang, Y. Aimuratova; U. Barres de Almeida, C. L. Bianco, Y. C. Chen, R. V. Lobato, C. Maia, D. Primorac, R. Moradia, and J. F. Rodriguez, is published in JCAP 10 (2018) 006 on October 3, 2018. The LIGO-Virgo Collaboration has announced the detection of GW170817 and has associated it with the gamma-ray bursts (GRB) 170817A. These signals have been followed after 11 hours by the optical and infrared kilonova emission of AT 2017gfo. The origin of this complex phenomenon has been attributed to a neutron star-neutron star (NS-NS) binary merger. The kilonova in this case would be powered by the radioactive decay of r-process heavy material synthesized in the NS-NS merger. However, as we show in this work, the gamma- and X-rays emissions of GRB 170817A are in clear contrast with the ones of any short-duration GRB associated either with a NS-NS merger or with other merger types (see details below). In fact, in order to probe the GW-GRB-kilonova association we confront our current understanding of the gravitational waves and associated electromagnetic radiation with four observed GRBs originating in binaries with NS and white dwarf (WD) components: 1) GRB 090510 the prototype of the authentic short GRB (S-GRB) subclass produced by a NS-NS merger leading to a black hole (BH); 2) GRB 130603B the prototype of the short gamma-ray flash (S-GRF) subclass produced by a NS-NS merger leading to massive NS (MNS); 3) GRB 060614 the prototype of the GRF subclass produced by a NS-WD merger leading to a MNS; and 4) we propose GRB 170817A as the prototype of a new subclass of GRB by a WD-WD merger leading to massive WD, and an AT 2017gfo-like kilonova. None of them support the triptych GW-GRB-kilonova. a. The NS-NS scenario cannot explain GRB170817A-GW170817 since this solution implies an X and gamma-ray prompt emission missing in GRB 170817A (see data up to 10 s data in the figure). b. Instead, X- and gamma-ray observations of GRB 170817A have led us to propose a new subclass of GRBs originating from WD-WD mergers leading to a massive WD. The occurrence rate of these mergers can explain the rate of GRB 170817A-like sources, they produce a gamma- and X-ray emission consistent with GRB 170817A and cannot be associated with GW170817. c. The kilonova AT 2017gfo can be powered by a different physical mechanism that the radioactive decay of r-processed heavy nuclei in the ejecta of NS-NS mergers: the cooling of the ejecta expelled in a WD-WD merger and heated up by fallback accretion onto the newly-formed massive WD. d. The WD-WD merger ejecta have a lighter nuclear composition with respect to the r-processed heavy nuclei present in the ejecta of a NS-NS merger. The identification of atomic species in kilonova spectra can therefore discriminate between the two scenarios. However, such an identification has not been possible in observed kilonovae since it needs accurate models of atomic spectra, nuclear reaction network, density profile, as well as radiative transport (opacity), not yet available in the literature. e. The outcome configuration of a GRB from WD-WD merger, namely a massive, highly magnetized, fast rotating WD, can become observable as a soft gamma repeater (SGR) or anomalous X-ray pulsar (AXP) as indicated in the WD-pulsar model introduced by Malheiro, Rueda and Ruffini in 2012.
f. The association of GRB 170817A and GW170817, from an observational point of view is, in our opinion, not yet sufficiently established to formulate a well-motivated answer on the non-null chance coincidence probability of the events. It is thus auspicable that the LIGO collaboration releases the templates of GW170817 in the interferometers to reconstruct the precise chronology of the space-time sequence of events in the LIGO detectors and in the Fermi and Integral satellites, necessary to validate the GW170817-GRB 170817A association. After having successfully predicted the SN 2013cq associated with GRB 130427A (Ruffini et al.2013), as an example for the BdHN case, on 28 July 2018, ICRANet researchers led by prof. Remo Ruffini had the opportunity to predict of the supernova (SN) appearance in an X-ray flash (XRF) case. At 17:29:00 UT, on 28 July 2018, the Swift-BAT triggered and located GRB 180728A. The BAT light curve shows a small precursor followed ∼ 10 s later by a bright pulse of ∼ 20 s duration (Starling2018). Swift-XRT did not slew immediately due to the Earth limb constraint, it began observing the field 1730.8 s after the BAT trigger (Perri2018). The Fermi-GBM triggered and located GRB 180728A at 17:29:02.28 UT. 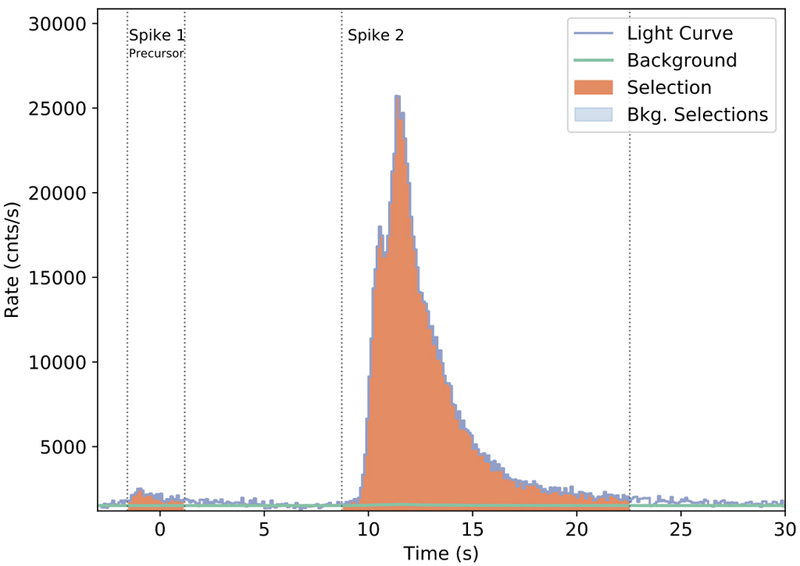 The angle from the Fermi-LAT boresight at the GBM trigger time is 35 degrees. The GBM light curve consists of a precursor and a very bright peak with a duration (T90) of about 6.4 s (50-300 keV) (Veres2018). A red continuum is detected across the spectral range of VLT/X-shooter, the absorption features due to Mg II (3124, 3132), Mg I (3187), and Ca II (4395, 4434) at a consistent redshift of z = 0.117. 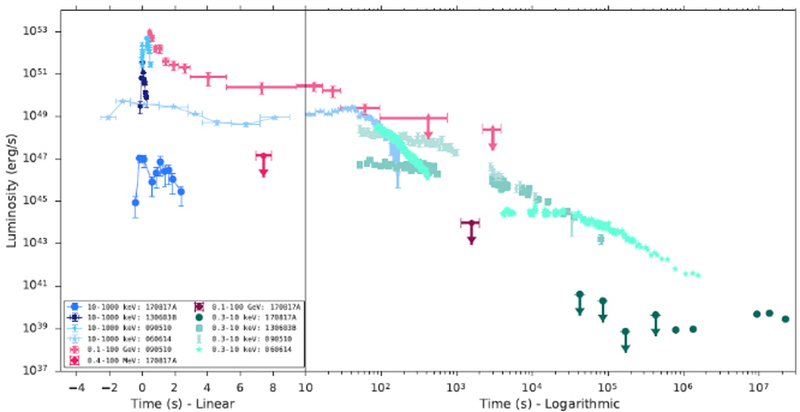 Although Galactic extinction in this direction is significant, a cam- paign to study the anticipated associated supernova should still be practical with moderate-aperture telescopes at this redshift (Rossi2018). GRB 180728A has T90 = 6.4 s (Rossi2018), peak energy 142(-15, +20) keV, and isotropic energy Eiso = (2.33 ± 0.10) × 1051 erg (Frederiks2018). It presents the typical characteristic of a subclass of long GRBs called X-ray flashes (XRFs, seeRuffini et al.2016), originat- ing from a tight binary of a COcore undergoing a supernova explosion in presence of a companion neutron star (NS) that hypercritically accretes part of the supernova matter. The outcome is a new binary composed by a more massive NS (MNS) and a newly born NS (vNS). Using the averaged observed value of the optical peak time of supernova (Cano et al.2017) and considering the redshift z = 0.117 (Rossi2018), a bright optical signal will peak at 14.7 ± 2.9 days after the trigger (12 August 2018, uncertainty from August 9th to August 15th) at the location of RA=253.56472 and DEC=-54.04451, with an uncertainty 0.43 arcsec (LaPorte2018). The follow-up observations, especially the optical bands for the SN, as well as attention to binary NS pulsar behaviours in the X-ray afterglow emission, are recommended. ... Up to now, we have observed at three epochs, specifically at 6.27, 9.32 and 12.28 days after the GRB trigger. The optical counterpart is visible in all epochs using the X-shooter acquisition camera in the g, r and z filters. We report a rebrightening of 0.5 ± 0.1 mag in the r band between 6.27 and 12.28 days. This is consistent with what is observed in many other low-redshift GRBs, which in those cases is indicative of an emerging type Ic SN ... For the last spectrum, we attempted the identification of a few features. In particular, we identify the broad dip at 7600 AA as due to the blend O I 8446 AA and Ca II 8492 AA, at the expansion velocity of 30,000 km s-1. At this velocity, we also identify the Si II 6355 doublet, as well as C II 6580. The width of the lines spans several thousand km s-1. Independent of the interpretation of the lines, the overall shape of the continuum, together with the presence of several absorption features a few thousands km s-1 wide, strongly indicate that this is a SN. The lack of identified H and He in the spectra suggests a classification of type Ic ... and the SN was confirmed in Selsing (2018). This SN associated with GRB 180728A is named SN 2018fip by the Transient Name Server. Therefore the prediction was confirmed. Also this year ICRANet organized the event "Researchers' night at ICRANet" on the occasion of the European Researchers' Night, in order to create a nice occasion for discussion among citizens and researchers. This event attracted a lot of people, as every year, and offered visitors a unique opportunity to take part in science activities aiming to showcase both the fascination of research as a career and its significant societal impact. The event was held in ICRANet center in Pescara on Friday 28 September 2018, from 4 PM to 10 PM. Also the Prefect of Pescara, Mrs Gerardina Basilicata was present. 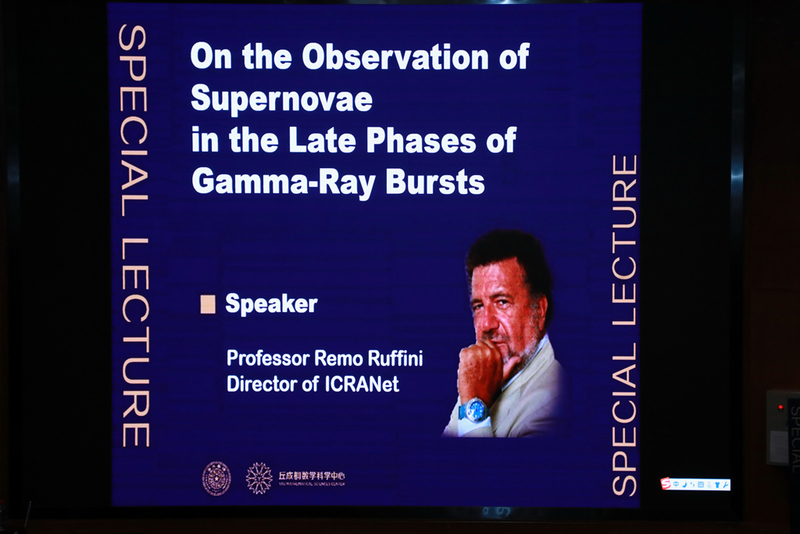 After the opening remarks of professor Ruffini, Director of ICRANet, Dr Wang Yu, Yerlan Aimuratov (ICRANet researchers and PhD students) illustrated the GRB 180727A and the supernova predicted and observed on the 15 of August 2018; Dr Luca Izzo, former PhD student of prof. Ruffini also joined the discussion from Spain, where he currently works. 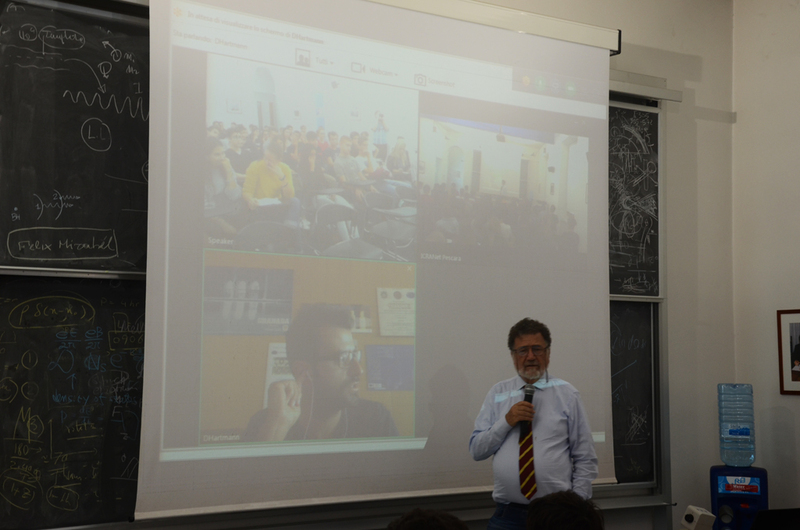 Then Prof. Costantino Sigismondi (ITIS Galileo Ferraris - Rome) celebrated with a conference the 50 years anniversary of the man on the moon and Professor Ruffini, together with ICRANet Faculty professors, discussed with participants about the present and future perspectives of science. Group photo of all the participants to the "Researchers' Night at ICRANet", 28 September 2018. The conferences left the place to several video projections in all the ICRANet building, concerning the "Caso Neutrino", the "l'Assoluto Relativo" and the conferences held at Besso Foundation in Rome I the framework of the MIUR project "Del Talento e della curiosità. Quando l'aquila e il passero volano insieme". 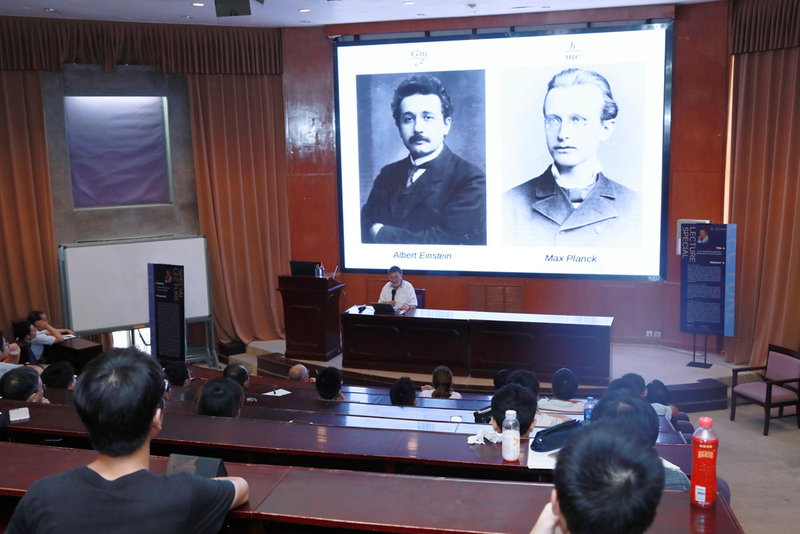 During the event, participants had also the possibility to visit the 2 exhibitions on "Einstein, Fermi and Heisenberg and the birth of Relativistic Astrophysics" and on "ICRANet and China". 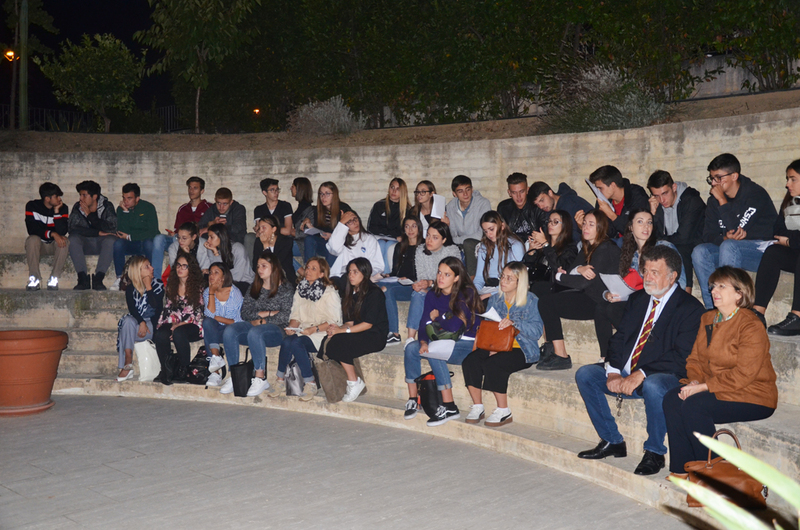 Moreover, from 8.30 PM, ICRANet organized the observations of Saturn and Mars with different telescopes, and this part was illustrated by the students of the Liceo Scientifico Galileo Galilei of Pescara. 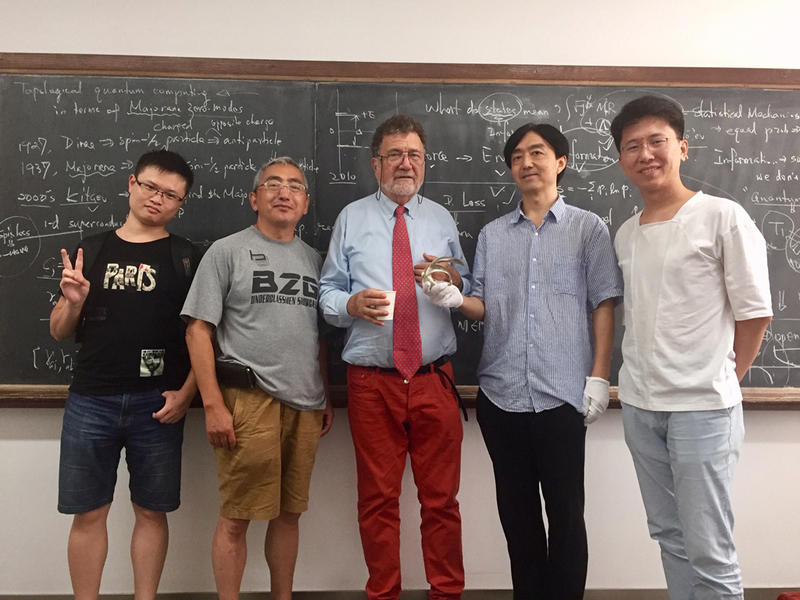 From 8 to 15 August 2018, Professor Remo Ruffini, Director of ICRANet, visited China since he was invited by Professor Shing-Tung Yau, to give a seminar in his Yau Mathematical Sciences Center at Tsinghua University in Beijing on the 9 August 2018. 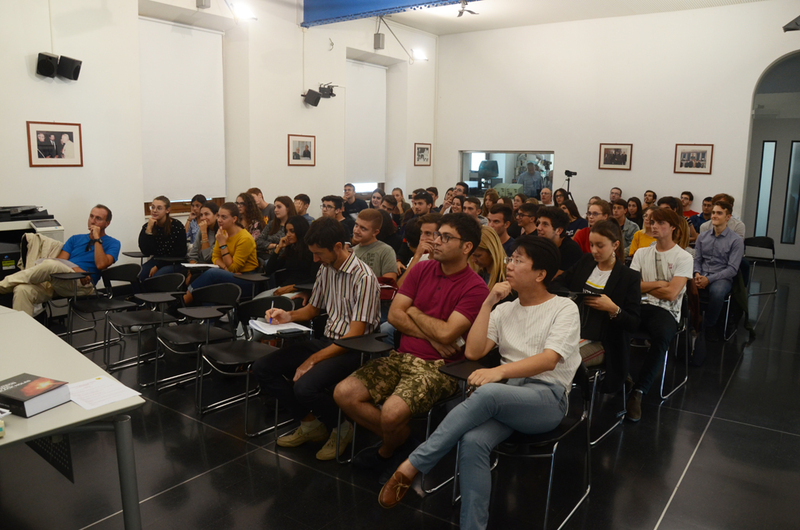 The seminar, titled "On the observation of supernovae in the late phases of Gamma-Ray Bursts", illustrated to the public the results obtained by Professor Ruffini, ICRANet researchers and PhD students (Y. Aimuratov, L. Becerra, C.L. Bianco, Y.C. Chen, D.M. Fuksman, M. Karlica, G. Mathews, R. Moradi, D. Primorac, J.A. Rueda, N. Sahakyan, Y. Wang, S.-S. Xue). Professor Remo Ruffini during his seminar at Tsinghua University in Beijing, 9 August 2018. 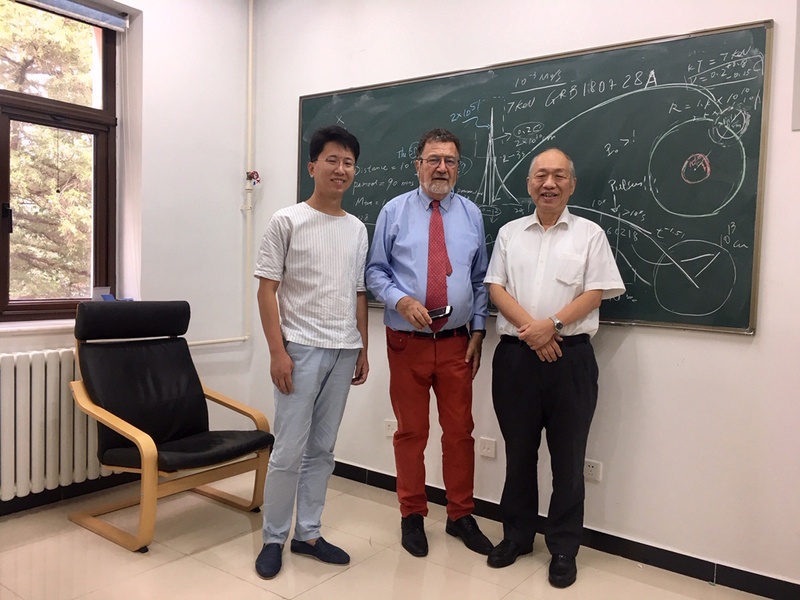 From left to right: Dr. Yu Wang, ICRANet PhD student, Prof. Remo Ruffini, Director of ICRANet, and Prof. Shing-Tung Yau, Director of Yau Mathematical Sciences Center at Tsinghua University. 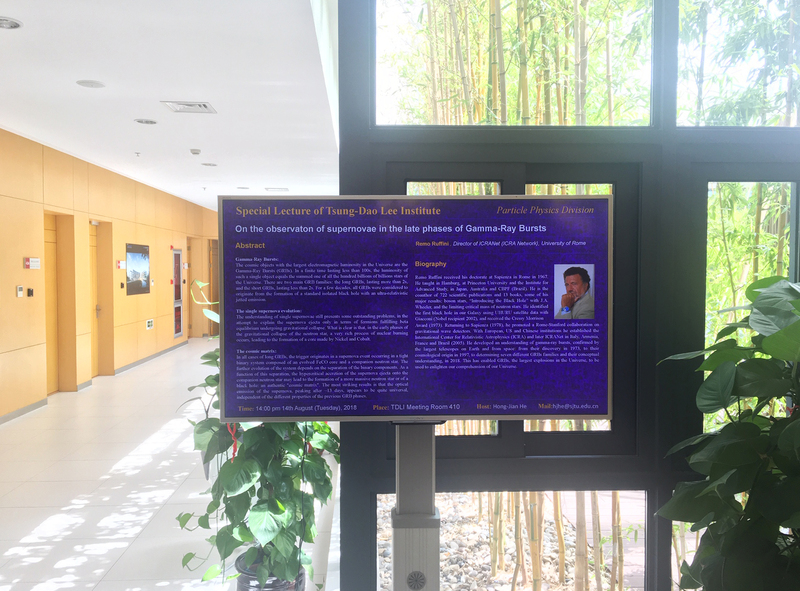 Accompanied by Dr Yu Wang, ICRANet PhD student, Professor Ruffini also visited the Tsung-Dao Lee Institute in Shanghai, where he was invited to deliver a C. C. Lin lecture on the same subject presented few days before in Beijing. During his visit in the Institute, Professor Ruffini had also the possibility to see the MG14 Award delivered in 2015 to T. D. Lee "for his work on white dwarfs motivating Enrico Fermi's return to astrophysics and guiding the basic understanding of neutron star matter and fields". Prof Remo Ruffini with the MG14 Award delivered in 2015 to T. D. Lee. 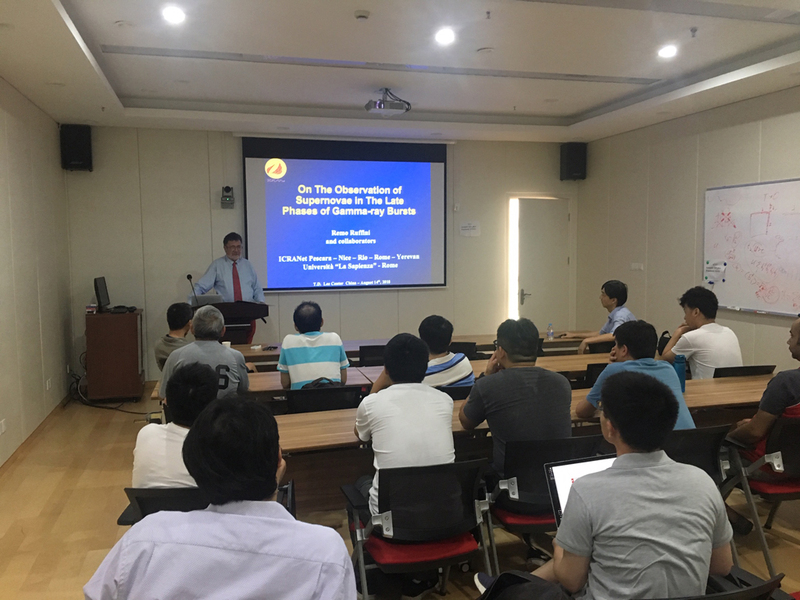 Professor Remo during his seminar at the Tsung-Dao Lee Institute in Shanghai, 14 August 2018. On the 4 September 2018, Professor Remo Ruffini, Director of ICRANet, visited LAPP (Laboratoire d'Annecy de Physique des Particules) in Annecy, France, where he was invited to give a seminar by its Director, Professor Giovanni Lamanna. 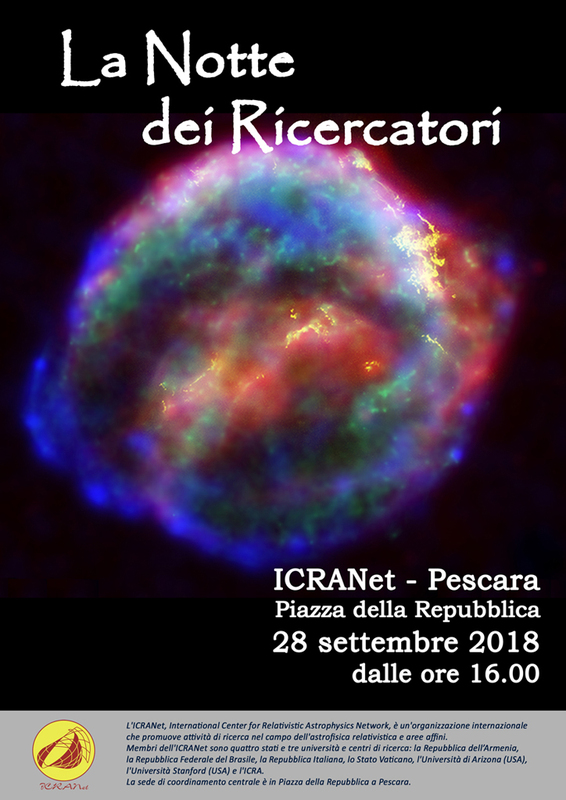 In this seminar, titled "GRB180728A, our predicted Supernova denominated on 27 August SN2018fip and conceptual inferences" (https://indico.in2p3.fr/event/17864/), Professor Ruffini illustrated how a sequence of fortunate events occurred after the 28 of July, when GRB190728A was observed by SWIFT and Fermi satellites. With his collaborators, they have identified this source as a member of the X-ray Flash (XRF) subclass of gamma-ray bursts (GRBs) in which a supernovae (SN) ejecta hypercritically accretes onto the neutron star (NS) companion leading to a more massive NS (MNS) and to a νNS-MNS binary. On the other hand, in the GCN23066 on 31 July 2018, they predicted the occurrence of a SN, indeed observed on 15 August (GCN23142). The significance of this result in discriminating the 8 different GRBs subclass has been analyzed. 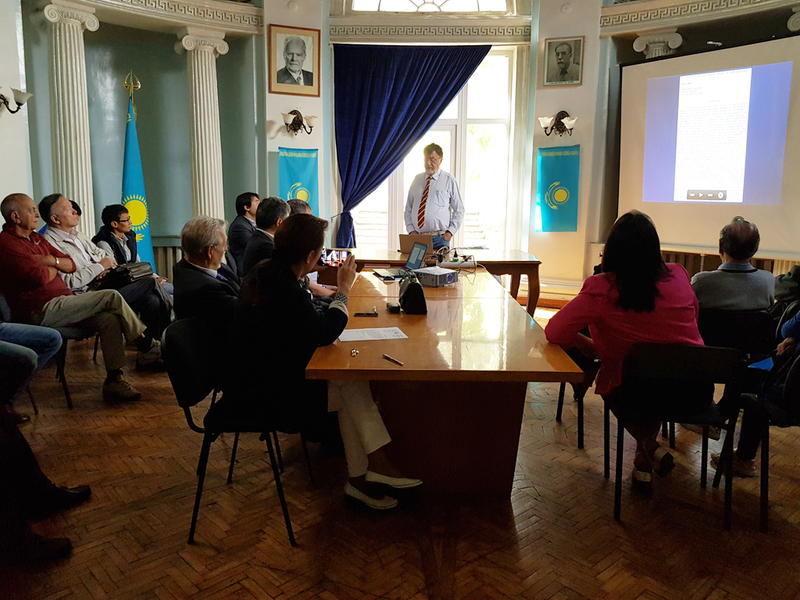 From the 6th to the 8th September 2018, Professor Remo Ruffini, Director of ICRANet, visited Kazakhstan. On the first day of his mission, he went to the Nazarbayev University in Astana, where he has delivered a seminar "GRB180728A, our predicted Supernova denominated on 27 August SN2018fip and conceptual inferences" and met its Vice President for Innovation& Research, Mr Kanat Baigarin. In the same afternoon, he met H.E. Pasquale D'Avino, Ambassador of Italy in Astana in the Italian Embassy residence, with whom he had fruitful discussions on the multiple and interesting possibilities of collaboration between Italy and Kazakhstan in the field of science. During his visit, Professor Ruffini signed also a cooperation agreement with the L.N. Gumilyov Eurasian National University (ENU) in Astana, together with its Rector, Prof. Yerlan Battashevich Sydykov. The main joint activities envisaged in the framework of this agreement include: the promotion of theoretical and observational activities within the field of Relativistic Astrophysics; institutional exchanges of faculty members, researchers, post-doctorate fellows and students; the promotion of technological developments; the organization of seminars, conferences, workshops, training and research courses, and joint publications. Professor Remo Ruffini, accompained by Prof. Abishev Medeu, during the signature ceremony of the Memorandum of cooperation in science and education with the Center for Space Research & Technology (NCSR) in Almaty. On the following day, Professor Ruffini flew to Almaty, where he had in the morning, accompanied by Professor Abishev Medeu (Al-Farabi Kazakh National University), a meeting with Professor Chingis Omarov, President of the National Center for Space Research & Technology (NCSR). 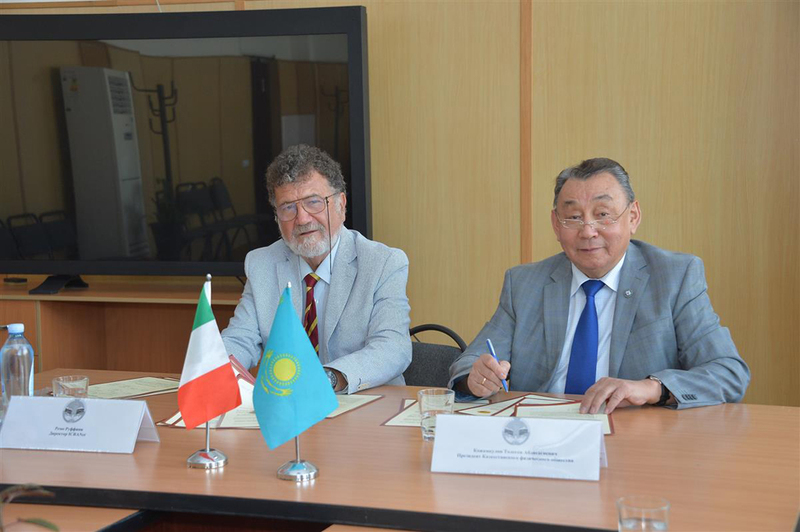 On this occasion a Memorandum of cooperation in science and education with the NCR - Kazakhstan was signed by Professor Omarov, President of the center, and Prof. Ruffini, Director of ICRANet. It will be valid for 5 years, starting from the date of its signature. The main forms of cooperation envisaged in the framework of this agreement include: exchange of scientific expertise, joint research activities, joint participation in research grants, exchange of scientific materials and experience. 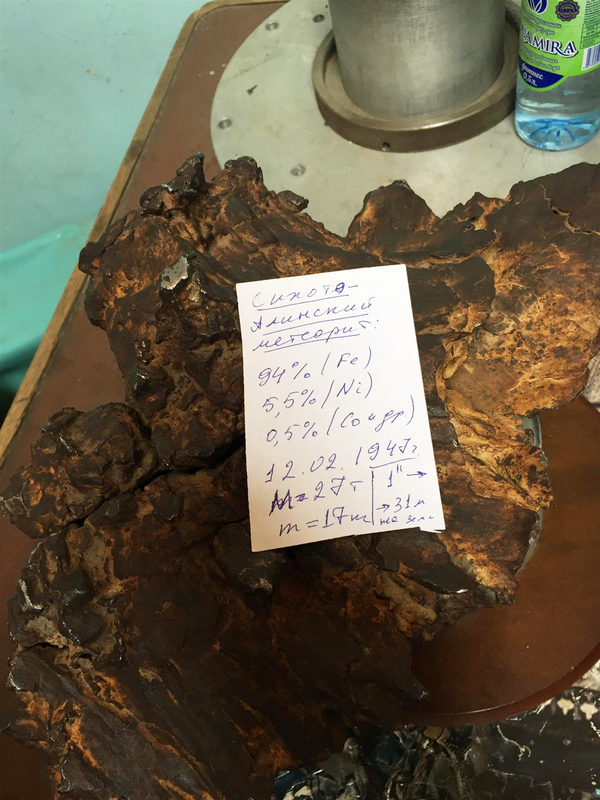 After the signature ceremony Professor Ruffini visited Fesenkov Astrophysical Institute (FAPHI) and had the opportunity to observe the Sikhote-Alin meteorite, an iron meteorite felt down on the Sikhote-Alin Mountains, in southeastern Russia, in 1947. Though large iron meteorite falls had been witnessed previously and fragments recovered, never before in recorded history had a fall of such magnitude been observed. In this institute, Professor Ruffini addressed the public with the seminar "GRB180728A, our predicted Supernova denominated on 27 August SN2018fip and conceptual inferences". The photo of the Sikhote-Alin meteorite located in the Fesenkov Astrophysical Institute. 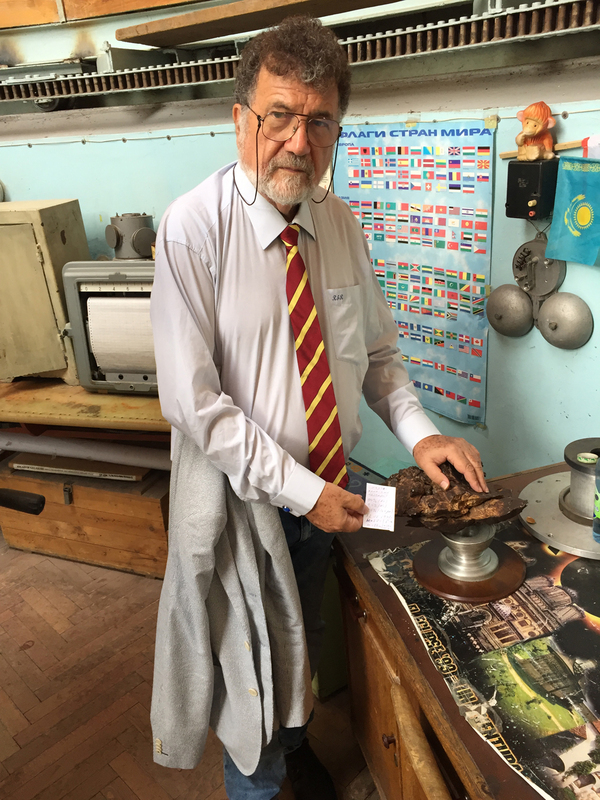 Professor Ruffini with the Sikhote-Alin meteorite in Fesenkov Astrophysical Institute (FAPHI). Professor Ruffini during his seminar "GRB180728A, our predicted Supernova denominated on 27 August SN2018fip and conceptual inferences" at the Fesenkov Astrophysical Institute. 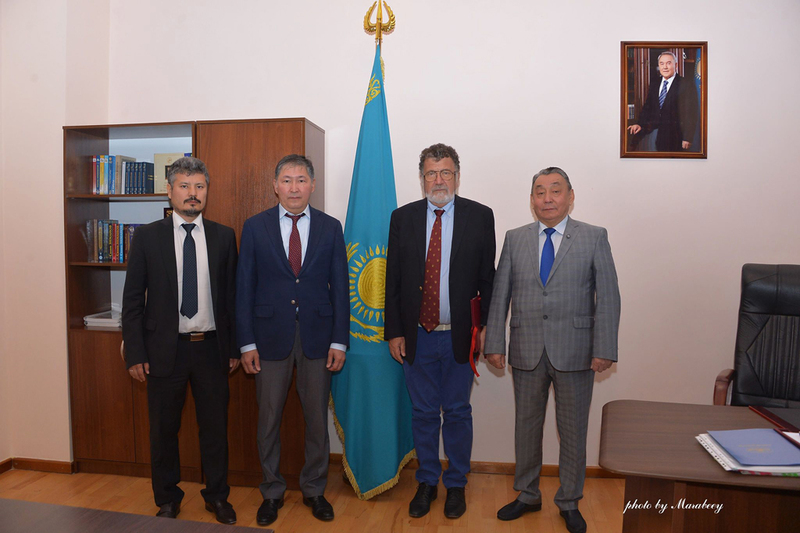 Moreover, Professor Ruffini met Academician Tolegen Kozhamkulov, President of the Kazakh Physical Society (KPS) and, on that occasion, the President of KPS, signed a cooperation agreement with ICRANet, represented by Professor Remo Ruffini. 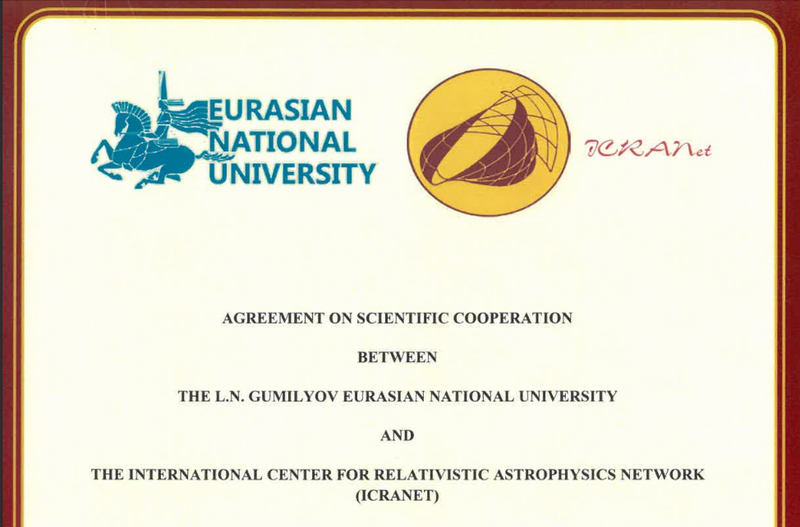 The main joint activities envisaged in the framework of this agreement include: the promotion of theoretical and observational activities within the field of Relativistic Astrophysics; institutional exchanges of faculty members, researchers, post-doctorate fellows and students; the promotion of technological developments; the organization of seminars, conferences, workshops, training and research courses, and joint publications. 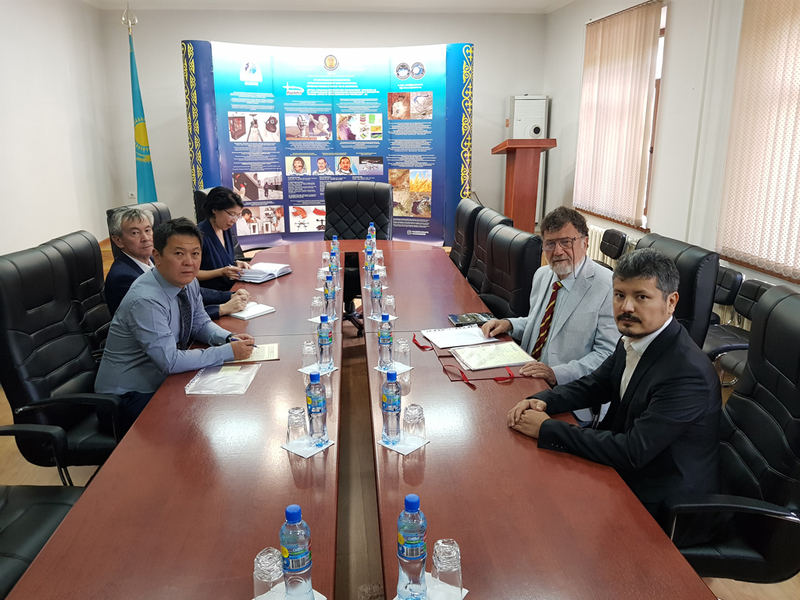 On Saturday 8 September, Professor Ruffini, accompanied by Prof. Kozhamkulov, Prof. Abishev and Yerlan Aimuratov, met H. E. Yerlan Sagadiyev, Minister of Education and Science of Kazakhstan at the Academy of Sciences building in Almaty. The main issue of discussion was the Kazakhstan's cooperation with ICRANet. Professor Rufifni with Academician Tolegen Kozhamkulov, President of the Kazakh Physical Society (KPS), during the signature ceremony of the cooperation agreement with KPS in Almaty. Professor Ruffini, accompanied by Academician Kozhamkulov and Prof. Abishev Medeu, during his meeting with H. E. Yerlan Sagadiyev, Minister of Education and Science of Kazakhstan at the Academy of Sciences building in Almaty. 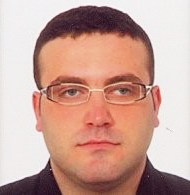 * From the 16 to the 30 September 2018, Professor Klaudio Peqini from University of Tirana - Albania, visited ICRANet center in Pescara. During his visit, he had the opportunity to discuss his scientific results and to have fruitful exchange of ideas with other researchers from ICRANet and from different parts of the world. * On the 24 September 2018, Professor Sang Pyo Kim (Kunsan National University, Korea), who visited ICRANet center in Pescara from 22 to 25 September, gave a seminar titled "QED Phenomena in de Sitter Space". On that occasion he discussed with ICRANet faculty members QED effective action and pair production for uniform electric and parallel magnetic fields in dS space, possible scenarios for magneto genesis, and physical implications of QED vacuum polarization in cosmology as well as astrophysics. The vacuum persistence is related to the Schwinger effect of spontaneous pair production in dS space. We obtain a pair production rate in the electromagnetic field which agrees with the known Schwinger result in the limit of Minkowski space-time and with Hawking radiation in dS space in the zero electromagnetic field limit. Using the zeta function regularization scheme, we calculate the induced current and examine the effect of a magnetic field on the vacuum expectation value of the current operator. We discuss Schwinger effect as a possible scenario for magneto genesis. We employ the in-out formalism introduced by Schwinger and DeWitt and apply the gamma-function regularization to find the one-loop QED action in the proper-time integral representation in dS space. The one-loop effective action becomes the famous Heisenberg-Euler-Schwinger action in the limit of Minkowski space-time and yields the one-loop gravity action in the zero electromagnetic field limit, which is a nonperturbative analog of Heisenberg-Euler-Schwinger QED action. Finally we discuss the physical implications of QED vacuum polarization in cosmology as well as astrophysics. 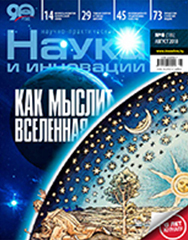 Following the Third Zeldovich Meeting organized by ICRANet and the National Academy of Sciences of Belarus in April 2018 the leading Belarusian science popular Journal "Science and Innovation" published by the National Academy of Sciences of Belarus has prepared a special issue "How the Universe thinks" devoted to astrophysics and cosmology. * "Gamma-ray bursts - the most bright and mysterious objects in the Universe" by Ivan Siutsou and Gregory Vereshchagin. We study tidal effects induced by a particle moving along a slightly eccentric equatorial orbit in a Schwarzschild spacetime within the gravitational self-force framework. We compute the first-order (conservative) corrections in the mass ratio to the eigenvalues of the electric-type and magnetic-type tidal tensors up to the second order in eccentricity and through the 9.5 post-Newtonian order. Previous results on circular orbits are thus generalized and recovered in a proper limit. We generalize to the Kerr spacetime existing self-force results on tidal invariants for particles moving along circular orbits around a Schwarzschild black hole. We obtain linear-in-mass-ratio (conservative) corrections to the quadratic and cubic electric-type invariants and the quadratic magnetic-type invariant in series of the rotation parameter up to the fourth order and through the ninth and eighth post-Newtonian orders, respectively. We then analytically compute the associated eigenvalues of both electric and magnetic tidal tensors. Twisted gravitational waves (TGWs) are nonplanar unidirectional Ricci-flat solutions of general relativity. Thus far only TGWs of Petrov type II are implicitly known that depend on a solution of a partial differential equation and have wave fronts with negative Gaussian curvature. A special Petrov type D class of such solutions that depends on an arbitrary function is explicitly studied in this paper and its Killing vectors are worked out. Moreover, we concentrate on two solutions of this class, namely, the Harrison solution and a simpler solution we call the w-metric and determine their Penrose plane-wave limits. The corresponding transition from a nonplanar TGW to a plane gravitational wave is elucidated. 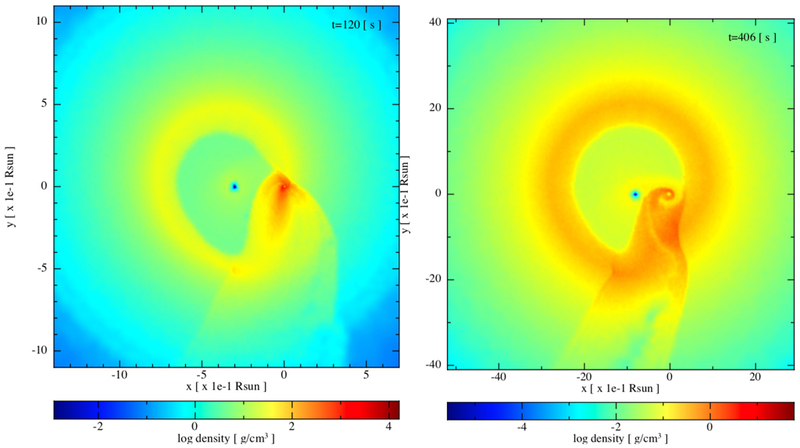 The observation of IceCube-170922A event from the direction of TXS 0506+056 when it was in its enhanced γ-ray emission state offers a unique opportunity to investigate the lepto-hadronic processes in blazar jets. Here, the observed broadband emission of TXS 0506+056 is explained by boosted synchrotron/synchrotron self Compton emission from the jet whereas the γ-ray data observed during the neutrino emission- by inelastic interactions of the jet-accelerated protons in a dense gaseous target. The proton energy distribution is ∼E-2.50p, calculated straightforwardly from the data obtained by Fermi-LAT and MAGIC and if such distribution continues up to Ec,p=10 PeV, the expected neutrino rate is as high as ∼0.46 events during the long active phase of the source or ∼0.15 if the activity lasts 60 days. In this interpretation, the energy content of the protons above > GeV in blazar jets can be estimated as well: the required proton injection luminosity is ≅2.0×1048ergs-1 exceeding 103 times that of electrons ≅1045ergs-1 which are in equipartition with the magnetic field. As the required parameters are physically realistic, this can be an acceptable model for explanation of the neutrino and γ-ray emission from TXS 0506+056. Our goal is to understand the phenomena arising in optical lattice fermions at low temperature in an exter-nal magnetic field. Varying the field, the attraction between any two fermions can be made arbitrarily strong, where composite bosons form via so-called Feshbach resonances. By setting up strong-coupling equations for fermions, we find that in spatial dimension d>2 they couple to bosons which dress up fermions and lead to new massive composite fermions. At low enough temperature, we obtain the critical temperature at which composite bosons undergo the Bose-Einstein condensate (BEC), leading to BEC-dressing massive fermions. These form tightly bound pair states which are new bosonic quasi-particles producing a BEC-type condensate. A quantum critical point is found and the formation of condensates of complex quasi-particles is speculated over.